Collectible trading cards (not to be confused with business trade cards) can be traced back to the 1700s, but the heyday for such paper collectibles seems to have been the late 1800s through early 1900s. 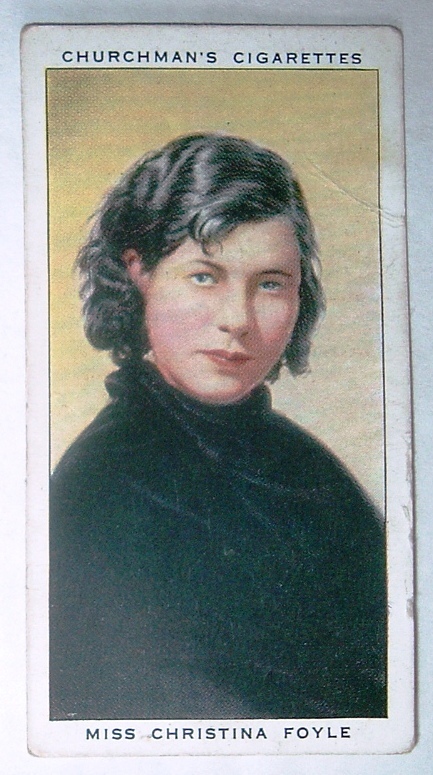 Included in that time frame is the popular cigarette card, issued with tobacco products of the day. Images on the cards could be of famous people, animals, places, or events. 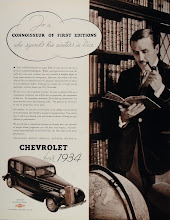 In addition to advertising the tobacco company, they also served a practical purpose of shoring up the flimsy packaging in which they were inserted. Among the more popular images in America for cigarette cards were those of professional baseball players. Their collectible value has grown over the years, with one player in particular, Honus Wagner, eclipsing the million dollar mark. Across the pond in Great Britain, there is no answer to the Wagner card, but tobacco companies did issue their own cigarette cards with images of a variety of celebrities and well-known personalities in various walks of life and professions (see Pat O'Connell's site for a good sampling of the variety). For Churchmans' Cigarettes, a brand of the W.A. 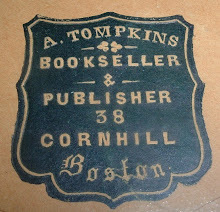 & A.C. Churchman company, a bookseller made the team one year (maybe more, but at least one year). That choice may have gone unrivaled in the States; at least, I don't know of any American booksellers who appeared on cigarette or other trading cards. The younger daughter of Mr. W.A. 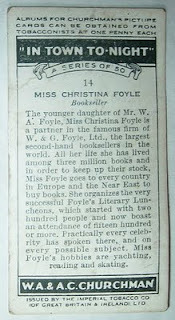 Foyle, Miss Christina Foyle is a partner in the famous firm of W. & G. Foyle, Ltd., the largest second-hand booksellers in the world. 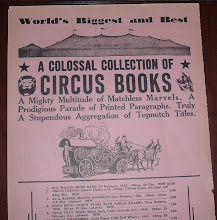 All her life she has lived among three million books and in order to keep up their stock, Miss Foyle goes to every country in Europe and the Near East to buy books. She organizes the very successful Foyle's Literary Luncheons, which started with two hundred people and now boast an attendance of fifteen hundred or more. Practically every celebrity has spoken there, and on every possible subject. 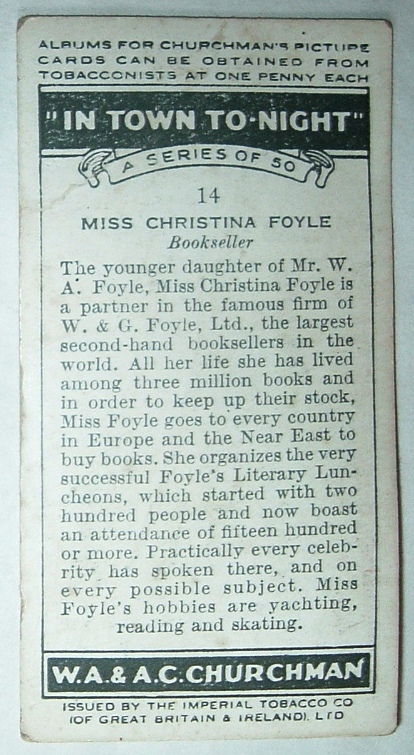 Miss Foyle's hobbies are yachting, reading and skating. In 1945, control of the shop passed to Christina Foyle, daughter of founder William. It was under Christina that the shop stagnated, with little investment and poorly paid staff who could be fired on a whim. She also refused to install any modern conveniences such as electronic tills or calculators; nor would orders be taken by phone. However, the shop excelled in other fields: Expensive books ordered from as far off as Germany were sent with a bill without prepayment. The store operated through a payment system that required customers to queue three times (once to collect an invoice for a book, and then again to pay the invoice, then a third to collect the book), simply because sales staff were not allowed to handle cash. Equally mystifying to customers was a shelving arrangement that categorized books by publisher, rather than by topic or author. A quote of this period is: "Imagine Kafka had gone into the book trade." In the 1980s, rival bookshop, Dillons, placed an advertisement saying "Foyled again? Try Dillons" in a bus shelter opposite Foyles. And where is Dillons today, while Foyles keeps on rolling? They weren't Foyled; they got Waterstoned. WOW! Thanks for the GREAT history lesson! I enjoyed reading 'both sides of the story' - so to speak. Just like postcards, they had two sides, didn't they!? Mr. C--they did indeed have two sides. I enjoyed the alternative view, too. Hi Carole- Thanks for reading and chiming in! Not sure what a MOO is... Miniature something-something? These cards are about 1 by 2.5 inches and I could have written much more about the history of the printing--some quite elaborate. 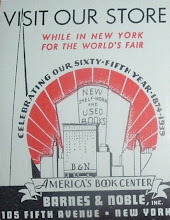 More examples at the NYPL site (sorry, don't have the link handy).